Unhappy with your smile? Dentists have a wide array of tools at their disposal for improving the appearance of your teeth. Cornerstone Dental Group, which is located in Cincinnati, OH, offers a full range of dental services. Dr. Ron Solomon and Dr. Angela Burleson-Ott are two of Cincinnati, OH's finest dentists. Here are five dental procedures that can perfect your smile. Bonding is the application of tooth-colored composite resin materials using a special light, which bonds the materials to the teeth to improve a patient's smile. Bonding is used to repair decayed teeth, chipped, and cracked teeth. Bonding is also used to close gaps between teeth and improve the appearance of discolored teeth. With dental crowns, your dentist can take your smile from being so-so to stunning. Dental crowns are protective coverings that are placed over weakened or damaged teeth. 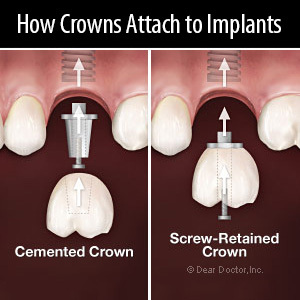 Dental crowns are strong and durable and they will restore full function of your weakened or damaged teeth. Dental implants are the gold standard in the replacement of teeth. Implants are replacement tooth roots made of titanium. They are placed into your jawbone to hold prosthetic teeth. Dental implants are the next best thing to natural teeth. With dental implants, you will look and feel younger and more attractive. Veneers are custom-made, porcelain shells which are bonded to the front of teeth. Veneers are used to fix teeth that are discolored, chipped, uneven, or worn down. These porcelain shells change the outside appearance of your teeth while leaving the healthy, natural teeth underneath. Professional teeth whitening removes years of stains, giving you beautiful results. In-office bleaching will give you a whiter smile in about one hour. One in-office bleaching session can lighten your teeth up to 10 shades lighter. A take-home treatment provides great results in 1 or 2 weeks of use. A take-home treatment can lighten your teeth up to 8 shades lighter. Give yourself a smile you love. Call Cornerstone Dental Group at 513-631-8920 today to schedule a consultation in Cincinnati, OH. A smile makeover will give you the confidence to smile again and enjoy the things you love doing. Remember, it's never too late to beautify your smile.